Acura is derived from the Latin "acu". It means "accurate". The trademark is a caliper used in the measurement. It represents the core values of the brand: accuracy and precision in Latin. 1990 saw the historic moment of Acura. The NSX car was launched. "Motor Trend", "Road and Track" and the other authoritative media were presented. In addition, Acura was awarded "Ten Perfect Car", "The World's Top Ten Car", etc. At the same year, Acura also released the second-generation Legend car and legend CA car. In 1991 the sales of Acura ranked third in the United States. Without doubt, Acura attribute the success to the outstanding performance. The wheel rim is important to the overall operation of the car. 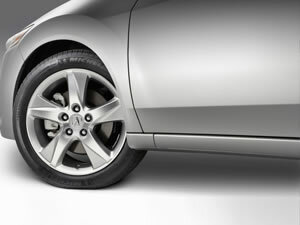 The front wheel rim brake and the rear wheel brake of Acura car adopt disc type. The design of the handbrake can satisfy the needs of the consumer. Acura car adopt mechanical parking/brake. The wheel (rim) of the car is made of steel. The spare tire size of Acura wheel rim can be optional. Wuxi Hengsheng Wheel Co., Ltd is a professional Acura wheel rim manufacturer and supplier in China. In addition to Acura wheel rim, we also provide other famous models steel wheel rims for our clients around the world, like Audi wheel rim, Buick wheel rim, Cadillac wheel rim, Chevrolet (GMC) wheel rim, Chrysler (DODG, PLYMOUTH) steel wheel rim, Daewoo wheel rim, FIAT style wheels, etc. We possess a professional technology team to guarantee the manufacturing of Acura wheel rim. We will checkout all the products and give out a survey report. According to the needs of every client, there will be a dynamic balance sample survey among parts of the qualified Acura wheel rims.